Anthony Horowitz is, perhaps, best known by a certain generation of young boys as the man behind the popular Alex Rider series of books. It is, I think, less well-known that he is also the man behind some of the most popular mystery dramas currently on British television: Midsomer Murders, Poirot and Foyle’s War are amongst his creations. Young boys of a different generation (namely my own, and it is here that I start to show my age) know him better for an altogether different series of books: those featuring the Diamond Brothers, beginning with his 1986 novel, The Falcon’s Malteser. With The House of Silk, Horowitz makes his first (and hopefully not his last) foray into the world of probably the most iconic detective of them all: Sherlock Holmes. When Dr John Watson’s wife takes a break to spend some time with a previous employer – and now good friend – outside London, he decides to move in with his old friend Sherlock Holmes for the duration. Whilst there, the men receive a visit from Edmund Carstairs, an art dealer from Wimbledon who spins a tale of train robberies, destroyed artworks, and a gang of flat-cap-wearing Irishmen operating out of Boston. He is afraid for his life, he tells Holmes, because a man wearing a flat cap has started standing outside his home, following him on evenings out; this man is, he believes, the sole surviving member of the Boston gang who has come to London to exact revenge on Carstairs for his involvement in the demise of his gang. Holmes, intrigued, takes on the case, and visits Carstairs’ home. Within hours the man in the flat cap has burgled the house and fled to a small hotel in Bermondsey, where Holmes’ Baker Street Irregulars track him down. When Holmes and Watson arrive on the scene, they find one of the Irregulars – a young boy called Ross – acting somewhat erratically. Inside the hotel, they find the man in the flat cap stabbed to death, and Holmes explains away Ross’s behaviour as being related. When the boy’s badly-beaten body turns up days later, Holmes and Watson find that things have taken a much more sinister turn, and that the mysterious House of Silk lies behind everything. As is traditional, the story is narrated by the ever-faithful Dr Watson, now an old and infirm man who has outlived his best friend by several years. Bookended by brief notes from this elderly Watson, we are given explanation for why this story has never been told before. As is also traditional, the story opens with a lesson, by Holmes, in ratiocination and deductive reasoning, as he divines the reason for Watson’s visit based on a handful of seemingly innocuous clues. Horowitz has an encyclopaedic knowledge of the Holmes canon, and sets his story in a definite time period, both in the very real sense – the story takes place in November 1890 – but also by placing it in relation to the rest of Conan Doyle’s stories – we are some seven weeks after “The Adventure of the Red-Headed League”, and Holmes has just completed “The Adventure of the Dying Detective”. There is no doubt, both in terms of the references both overt and implicit, and the general tone Horowitz strikes, that the author has immersed himself in the stories of Sir Arthur Conan Doyle whilst writing this latest adventure. It should be noted that this is the first Sherlock Holmes story that has ever been endorsed by the Conan Doyle estate, which should go some way to indicating how close Horowitz has come to depicting Holmes and the sometimes-hapless Watson. Horowitz pulls out all the stops, reintroducing us to a whole cast of characters that have become, over the years, part of the national – if not global – consciousness: apart from Holmes and Watson, there is the ever-present and often-ignored Mrs Hudson; Detective Inspector Lestrade; Holmes’ unofficial police force in the shape of the Baker Street Irregulars; the more-intelligent older brother Mycroft; and, of course, Holmes’ nemesis, Professor James Moriarty. With one exception, these characters are introduced naturally, and play roles that are as familiar to any Holmes fan as the Persian slipper where he keeps his tobacco, or the infamous address at which he lives. Unfortunately, Moriarty’s introduction seemed slightly shoe-horned, as he appears as a kind of deus ex machina whose intervention, in the end, goes nowhere. But this is a minor quibble, and in no way detracts from the story, or interferes with canon. The House of Silk consists of two mysteries which seem, at first, to be separate, one nested neatly inside the other and the two related, seemingly, by the flimsiest of links. “The Man in the Flat Cap” proceeds to a seemingly neat conclusion, and then Holmes hurries off in pursuit of the “The House of Silk”. 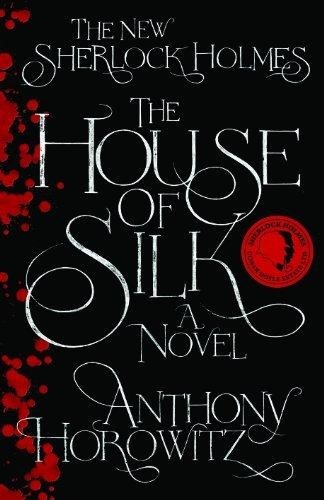 But as the novel progresses it becomes clear that the two cases are more closely related than it seems at first and as the detective wraps up the mystery of the House of Silk, he returns his attention to the original mystery. In some ways, as with many Holmes stories, this is not a mystery for the reader to solve: it is a showcase for the singular talents of Sherlock Holmes. Like the stories of Conan Doyle, there are plenty of clues scattered around, and the eagle-eyed reader may be able to piece together some of the solution. Horowitz does a fantastic job of keeping all the proverbial balls in the air, creating a perfectly-plotted set of mysteries, and a more-than-satisfactory set of solutions, while all the time maintaining the spirit of the original stories. [I]t has been good to find myself back at Holmes’s side, […], always one step behind him (in every sense) and yet enjoying the rare privilege of observing, at close quarters, that unique mind. I doubt I could have said it better myself. As someone who has read more than his fair share of second-rate Holmes spin offs, I can definitely recommend this one, Stu. It could easily have been written by ACD, and almost feels like Horowitz is finishing one of Conan Doyle’s unfinished stories, if you know what I mean. Horowitz is obviously very passionate about the man, and it shows through in his work: probably one of the reasons why the Conan Doyle estate have approved this one out of all the Holmes novels and stories that have appeared over the course of the last hundred years or so. If you’re a fan of Holmes, you should definitely check this out. I don’t think you’ll be disappointed. Stu – this one is definitely worth the effort! Much better than any of the Holmes spin-offs I’ve read to date.